Two fragrances from my purgatory basket, which is where I put samples when I just can't make up my mind about them and want to be sure to try them again, later, sometime. I swore I would clear out five last weekend, but only managed two: Etro Jacquard and HYLNDS Bitter Rose, Broken Spear. Do comment if you've recently retried any samples that you just couldn't decide about! 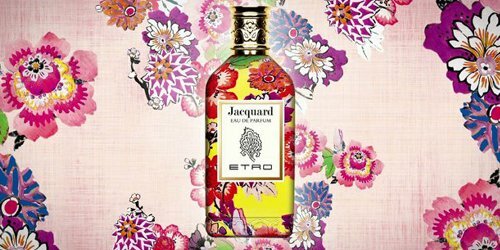 The packaging and digital imagery for Jacquard, last year's launch from Italian brand Etro, are perfect: I wanted to love the fragrance right away. And Jacquard starts with some promise: a happy burst of citrus cut with a peppery bite, and already a light dusting of powder, ever-so-slightly-earthy, from the iris (the notes include bergamot, angelica, black pepper, elemi, orris, jasmine, ylang ylang, vetiver, sandalwood, violet and musk). The early stages do a reasonable job of conjuring up the lush, sunny garden mentioned in the press materials. Instead of getting deeper, more floral, Jacquard quiets down into a very sheer floral over an almost-creamy woody base with a touch of vetiver, all of it smoothed over with a veil of powder; it reads to me almost like a peppery variation on Prada Infusion d'Iris, and like that scent, would make a good no-brainer fragrance for days when you just can't decide what to wear, or want to be sure your perfume does not overwhelm. Verdict: Very nicely done but I don't quite love it; still, even after what has now been four or five tries, I am reluctant to put the sample in the "no" pile. Another way to put it is that I would definitely wear it if I owned it, but am not moved to buy, especially since it only comes in 100 ml. Would I buy it in 15 ml, that is the question, and I don't know the answer. I'm giving up on this one. Do comment if you've tried it! Etro Jacquard was developed by perfumer Mathieu Nardin and is available in 100 ml Eau de Parfum, $195. 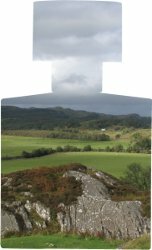 Branch knights and their travels to prehistoric Scotland – smelted iron, larchwood, thistle, emboldened with bitter rose and amber." The notes are listed as embers, wild mountain thyme, cubeb, bitter rose, thistle, nutmeg, smelted iron, amber and larch. If that sounds weird, well, it is. Esquire aptly titled an article about the HYLNDS fragrances "If Game of Thrones were a Cologne", and I can't remember exactly what Kevin said about them when I sent them to him, but suffice it to say that he sent them back. Bitter Rose, Broken Spear starts Difficult, with a capital D. It's a greenish herbal rose, and it's bitter, yes. It has strong peaty / boozy overtones mingling with a considerable dose of medicated BandAids, with vague tinges of charred woods to sweeten the pot, as it were — if I didn't know who made it, I would have guessed Strange Invisible Perfumes. In keeping with the "smelted iron" idea, I suppose, it also has a pronounced metallic edge for a time. It gets a smidge more wearable as it calms into a dusky, woody amber-y rose, still quite herbal. As advertised, it smells like something from another time (or perhaps from a post-apocalyptic / steampunk future); the image that comes to mind is of an aged vessel of copper or bronze, just starting to take on a greenish patina. Verdict: Despite its somewhat melancholy tone, I found Bitter Rose great fun to wear: it's the perfect antidote for anyone sick of same-y, office-friendly perfumes, but it's not, to me, weird for the sake of being weird, that is, I also think it smells good, albeit not in a way that I'd expect to be universally appreciated. I definitely don't need a full bottle, but I'm impressed. DS & Durga HYLNDS Bitter Rose, Broken Spear is $180 for 50 ml Eau de Parfum. I love DS & Durga’s “Burning Barbershop’ and I like the newest men’s collaboration they just created for J Crew. I never even heard about this latest release until I was in the Williamsburg J Crew store and I saw the lovely bottle. It smelled pretty good, however, I just could not allow myself to purchase it as it would be too mainstream a scent for me to buy since it is being carried at J Crew. I live in Brooklyn and I have a feeling every guy in Williamsburg will be wearing that fragrance within a couple of months. Reminds me of a less smooth Patour Pour Homme and I must say DS & Durga does a wonderful job with their scents. in 2012 I was at a wedding brunch with the husband and wife team behind the DS & Durga brand and had no idea that they were the creators of DS & Durga. Probably for the best as I would have gushed over the great job that they do on their fragrances. Agree they do a great job — it’s too bad the J Crew one (you mean Homesteader’s Cologne Water? or have they done another since that?) did not get as much press as the J Crew + Arquiste set. Thanks for the review. Those HYLNDS sound like fun. I don’t why I often forget about Etro since I have a couple of bottles and several decants that I really like but haven’t worn in a dog’s age (the two incenses, Vetiver, Anise, and Palais Jamais). My own personal take, perhaps wrong (obviously!) is that Etro has been making less interesting fragrances lately. Also possible that there’s just so much more competition in niche now that they don’t stand out the way they used to. Price has gone up, too. I just went back to a passel of scents yesterday that were in my undecided bowl, and a few have stayed there, again. They include a handful of “dark roses” that I purchased to explore the theme a while back: Tom Ford Noir de Noir, Gucci L’Arte di Gucci, Le Labo Rose 31, ELdO Rossy de Palma, etc. . . The fact that they have qualities in common seem to be making it especially difficult for me to discern if there’s one I really like well enough to purchase and wear! Just when I think there’s a winner, something catches my attention about another one, and I’m back to indecision. But you did get rid of a few, that’s something. I sometimes think I should empty the whole basket — it’s so rare that anything gets permanently removed! Well, “get rid of” might be overstating it! Some just ended up in my “reference” pile! These are scents that I can’t quite part with–they’re often remarked upon or whatever–so I “file” them away in case I want to sniff them later. Then a smaller portion end up in my give-aways box for freebies with swaps or what-have-you. In any case, the progress is SLOOOoooooow! Glad to hear you liked the D.S. & Durga. I haven’t tried many of them, but I’m very fond of My Indian Childhood – it’s also both very different and delicious smelling. They seem to be doing something very different with HYLNDS than with the regular line, which is fun. Yesterday I tried a sample of Atelier Vanille Insensee again after letting it sit in the “maybe pile” for a few weeks. I’m glad I did because it is an unusual and gooooood vanilla. It starts out unsettled and odd on my skin, but then it calms down, and it is so entertaining in the way it just wafts around. And I can faintly smell it on my wrist today. It’s that good. That Jacquard bottle is a beauty. You are doing better than me if they only sit in the pile a few weeks!! I rememering liking Jacquard too. Etro has some nice fragrances in their collection but I don’t find them leaving much an impression after my tries. Just them being nice or otherwise. Hi Robin, Happy Friday. J Crew released a DS & Durga Longshoreman fragrance for men in 3.4 ounces for $106.00. It smelled very nice I must say. There was no release or fanfare by J Crew when I asked about the release. It really is lovely. The more that I think about it the more I think about going back and picking up a bottle. If you would like a sample let me know and I will send you one. It’s definitely in line with the same quality that they DS & Durga does for their signature line and Hylnds. Thanks so much — only knew about the earlier one. I will announce it and will see if I can find a tester but may get back to you if I can’t!